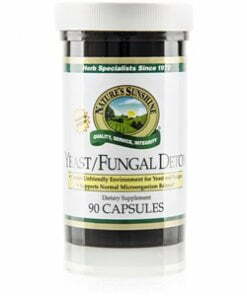 Nature’s Sunshine Yeast Fungal Detox balances yeast and friendly microflora to keep the immune, digestive, and urinary systems working properly. Yeast and microflora balance can be affected by a lack of nutrients in the modern diet or other factors, but this formula promotes proper detoxification and encourages a healthy environment for microflora to flourish. 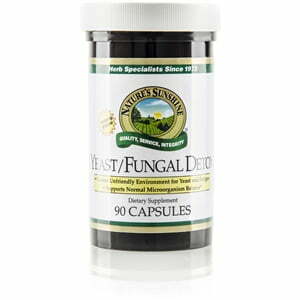 Yeast Fungal Detox is packed full of nutrients from the following ingredients: caprylic acid, propionic acid, sorbic acid, Echinacea angustifolia root, oregano, garlic, pau d’arco, selenium, and zinc. Instructions: Take one capsule three times daily with a meal. Do not exceed recommended dose. If symptoms of headache, nausea, or diarrhea develop, reduce dosage and see your health care practitioner. Cellulose (plant fiber), magnesium stearate (vegetable), maltodextrin, gelatin, and water.